Is it okay to drink sports drinks during pregnancy? The ultimate in hydration – the sports drink is available in every grocery and convenience store on the planet. When pregnant you may think it is okay to continue drinking your favorite sports drink, but you would be wrong for multiple reasons. Sports drinks are formulated to replace sodium, potassium and other electrolytes lost during intense physical activity and sweating. If you are pregnant, there is less chance you are running an ultra-marathon or working out for hours on end. Typically, water offers enough hydration even if you are exercising. Some sports drinks include guarana, synephrine, green tea, black tea, caffeine and other stimulants to increase energy. The combination energy drink and sports drink is particularly dangerous for pregnant women as caffeine should be limited during pregnancy. 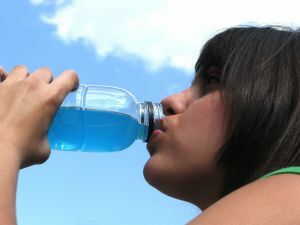 Supplements, like those sold in sports stores, are not tested on pregnant women and neither are certain sports drinks. There are tons of herbs on the market that could cause harm to the fetus – which is a huge reason to avoid drinking sports drinks during pregnancy. If you are performing a physical activity that causes excessive sweating, talk to your physician about the best means of rehydration. If your doctor suggests Gatorade, Powerade or other branded sports drink stick with the exact brand suggested. Previous: Is it Possible I May Still Be Pregnant?